The mutual fund industry once again came together on June 12th for the 14th Annual Expect Miracles Golf Classic to support Mutual Funds Against Cancer (MFAC). 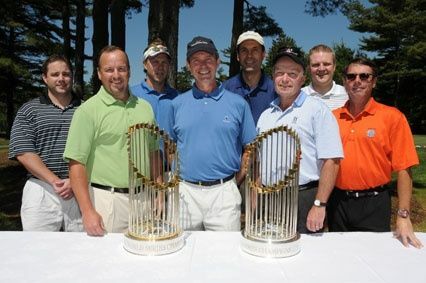 The event raised over $600,000 for its mission to support The Center for Applied Cancer Sciences (CACS) at Dana Farber. CACS is creating a drug discovery and development pipeline for six of the deadliest cancers: colon, pancreas, lung, melanoma (skin), myeloma (blood) and glioblastoma (brain). Along with WEEI’s John Dennis, the “Official Voice” of Mutual Funds Against Cancer who was on hand to emcee the dinner, MFAC was honored when keynote speaker Joe Andruzzi, former three time Super Bowl Champion and recent cancer survivor, addressed the audience with a heartfelt speech on the importance of cancer research in addition to his battle with cancer. Joe received a standing ovation and later mixed and mingled with the guests. The Golf Classic, with Foundation Sponsor Interactive Data Corporation, hosted more than 450 golfers representing over 100 mutual fund and financial services firms, and again expanded to two golf venues, including Pinehills Golf Club and Waverly Oaks. The first-place winners on each course were team Beacon Consulting Group (Jones), State Street Corp. (Nicklaus) and team Spagnolo Gisness & Associates, Inc., (Waverly Oaks). The event was further highlighted into the evening by a dinner and awards ceremony, coupled with a live and silent auction raising over $45,000. A special thanks to RockStar Limo for providing all the transportation packaged with some of the amazing live auction items. Several special awards were presented at the reception by MFAC's founder and Chairman, Frank Strauss. Chris Johnson was the recipient of the Guardian Angel scholarship. This scholarship is given annually in memory of Paula Pearlstein, a long time MFAC supporter who passed away in 2004 at the early age of 32. Chris, a cancer survivor, will use the scholarship towards his law degree at Massachusetts College of Law. Stan Bornstien from DB&R was awarded the Expect Miracles Award for his dedication and contribution to MFAC over the past two years. Long time MFAC volunteer Nancy Stokes of State Street was awarded the CJ Award for her many years of commitment to all the Expect Miracles' events. MFAC had a tremendous day and is looking forward to seeing all its supporters at next year's event!